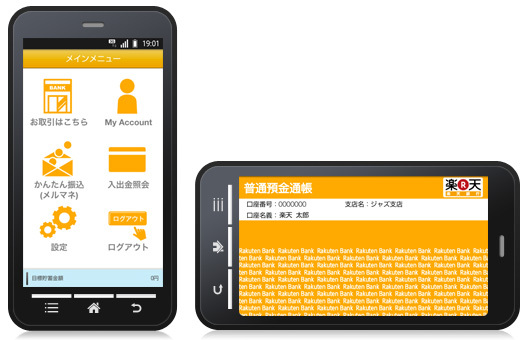 Applications “Rakuten Bank” is the application software for Android with a transfer function. In addition to the details of deposits and withdrawals and account balance inquiry, transfer to an account in the bank and other banks it is possible to use the (Merumane) easy transfer. Customers are free to download from Google Play, are available. Log in to the site was built for smartphone Rakuten Bank, savings deposits and foreign currency deposits, transfer, purchase, etc are available toto / BIG. You can check your status, etc. to achieve the target savings amount of account information such as account number, savings and time deposit balance was set in advance. You can see the details of savings account deposits and withdrawals of 50 latest. When the screen to landscape further, traded on the screen to display the contents to imitate the passbook savings account. Furikomeru easily available to enter your name and e-mail address of the destination to transfer “(Merumane) transfer,” That’s easy.